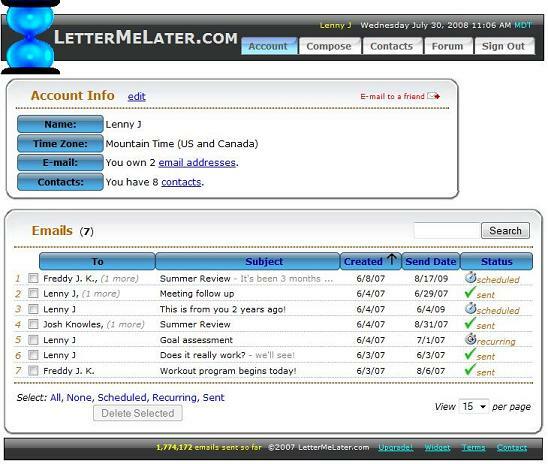 LetterMeLater gives you the features that are missing from your email service. Write your emails now, and have them sent - whenever! You select the date and time. Name: this is sent with your emails. Allows recipients of your emails to know who you are. If you have many email addresses, once you're signed in you can enter more email addresses that you own, and then specify which address you are sending from with each message. Time zone: this is for when you schedule an email, you specify it in your own local time. Password: something you choose that allows only you to have access to your account. All your personal information is kept private. View all your account information on the "my account" page. Notice that your current local time is displayed in the upper-right hand corner. Click on the email description to view, edit, or delete the email. A green check mark indicates that the email was sent successfully. Import your contacts and fill out your emails easily and error free. 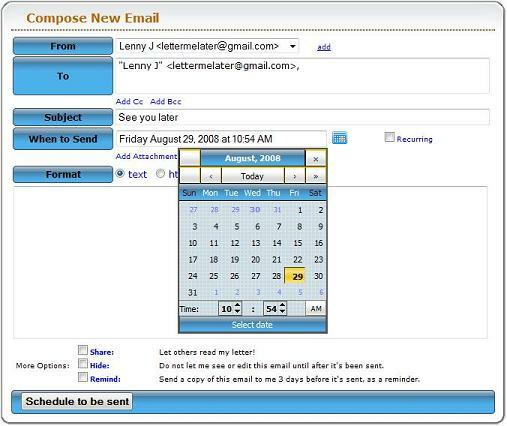 Also create groups of contacts for emails that you often send to several people at once. They are handy for group mailing lists, since when you need to add or remove contacts from your group, the recipients in all of your scheduled emails to this group will be updated automatically. Select your dates from the calendar! Makes it more simple and less error prone. Hold down on the right or left arrow to jump straight to the month or year. 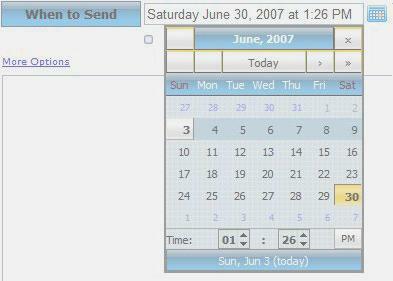 When you have selected a date, it will be written in the text box. You can schedule emails to be sent down to the minute! And don't worry about making a mistake, it will show you the exact time that it has been scheduled to be sent, and it can be modified before it gets sent. This means that you can have an email sent multiple times! You can either select a range and interval, or select the dates individually. Or you can even enter the dates manually, one per line. For example you could enter "30 days" on one line, and "90 days" on the next. The same formatting rules apply as listed above. You can schedule emails right from your own email program. Just send the email to and enter the recipients and time to send, and it will be scheduled on our site. We promise that once you get the hang of this, you'll be using it all the time! Nearly all cell phone service providers will allow you to send text messages by email, and now you can schedule them to be sent whenever you want. To see a complete list go here.